Stephen Philips is widely known for his patient and unorthodox approach to ambient music, which yields some of the most uniquely beautiful and evocative ambient music that can be found. With his latest Earth Mantra release, titled 31 O'Clock, 30 Won a Clock [Buddha 1 Mix 1], he takes us on yet another distinctive journey, this time through the worlds of the FM3 Buddha Machine. As lovers of ambient music, we think this product is one of the fundamentally coolest things we've seen in a LONG time (and they make great holiday gifts). But even cooler, FM3 has decided to release the sounds of the device under a Creative Commons license, and in fact actively encourages people to reuse the sounds and remix them into new music. 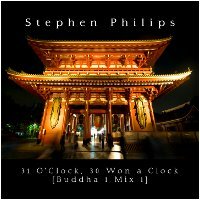 In this release, Stephen takes the listener on a journey through the sounds of the Buddha Machine, but firmly stamping his own unique ambient world view onto the music. The result is a magnificent longform piece that is perfectly suited for casual background listening, for nighttime sleep listening, or really for any setting where lovely, unobtrusive ambient music fits. We love it.